Mcclellan, Catharine. "Tutchone". The Canadian Encyclopedia, 16 October 2018, Historica Canada. https://www.thecanadianencyclopedia.ca/en/article/tutchone. Accessed 22 April 2019. The fluctuating fauna and subarctic climate, with warm summers and very cold winters, required a seminomadic way of life. Families gathered in spring and summer fish camps, at autumn meat camps, and clustered for part of the winter near dried food supplies and at good fish lakes. 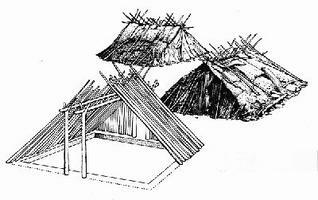 These lodges of the subarctic people were quickly assembled with poles covered with bark or skins (artwork by Gordon Miller). The Tutchone, a First Nation people numbering several thousand, are among the most numerous of the more than 7200 Yukon Aboriginal people of First Nations heritage. Their homeland is the vast plateau dissected by the Alsek and Yukon River headwaters, flanked on the southwest by the Coastal and St Elias mountains and on the northeast by the Selwyn range. 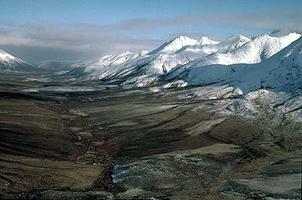 The Tutchone hunted caribou, moose, sheep and smaller game, especially marmots, varying hare and ground squirrels. 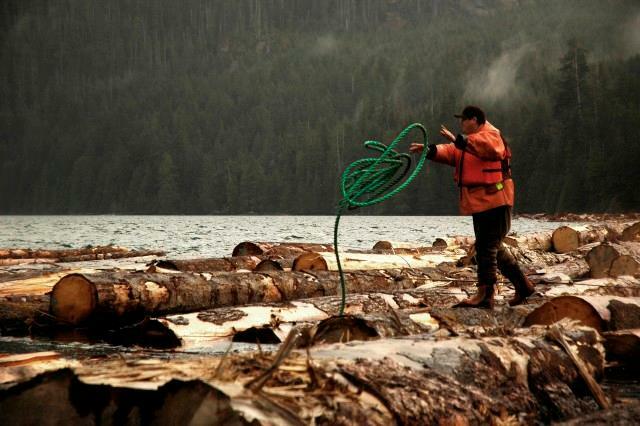 They also took birds and fresh water fish, and some bands had access to annual salmon runs. The fluctuating fauna and subarctic climate, with warm summers and very cold winters, required a seminomadic way of life. Families gathered in spring and summer fish camps, at autumn meat camps, and clustered for part of the winter near dried food supplies and at good fish lakes. By late winter communities often scattered to find game, however, starvation was a common threat. The 19th-century Fur Trade developed winter trapping and encouraged dispersion of families. Some 19th-century Tutchone, influenced by the Coast Tlingit with whom they traded, had plank dwellings, but most lived in double lean-tos of brush or domed skin tents. Since dog traction came only with European contact, belongings were limited to those which could be easily carried or made on the spot, such as the snares used to catch animals of all sizes. Much of the technology was quite expendable, but the knowledge of how, where and when to use it made it highly efficient. Some Tutchone had raw copper for making knives and arrowheads; the majority used bone and antler. Women made fine birchbark containers and beautiful tailored skin clothing. Descent is organized through the female line and lineages are grouped into exogamous moieties, Crow and Wolf. Traditionally, there was no formal political organization, but strong chiefs attracted the most followers. Wealth-based rank began to develop in the 19th century as the result of trading and intermarriage with Coast Tlingit seeking furs to sell to Europeans on the coast. Tutchone nearest the coast were incorporated into clans bearing Tlingit names. Dietary and various social observances marked birth, puberty and death. Children learned early how to maintain good relations with the powerful spirits of animals and other natural phenomena on whose good will the welfare of humans depended. Shamans, especially, enlisted the help of strong spirit powers to locate game and cure illness. Northern and Southern Tutchone are primarily spoken in northwestern British Columbia and the Yukon; Southern Tutchone is more common and is taught to children in Kluane communities. People expressed their world view in singing, dancing, oratory and extensive oral narrative and are now publishing literature and and orthography has been developed by the Yukon Native Language Centre. The influx of miners and explorers during the Klondike Gold Rush of the late 1890s and building of the Alaska Highway in 1942 drastically altered Tutchone culture. The Aboriginal people gradually shifted to a dual economy based on wage labour as well as hunting, fishing and trapping. Like other Yukon Aboriginal peoples the Tutchone did not sign a treaty (see Treaties) and several Tutchone leaders, such as Elijah Smith (died 1991), Paul Birckel and Harry Allen, through helping to develop the Council for Yukon Indians (now the Council of Yukon First Nations), helped bring about a land claims settlement signed by most Yukon First Nations in 1993. Tutchone were also active in forming the Council of Yukon First Nations, organized in August 1995 with the goal of establishing a Yukon First Nation government to co-exist with the Yukon Territorial and federal governments. 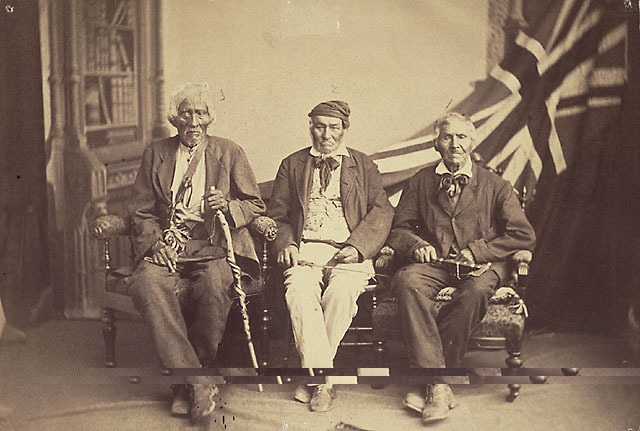 The Northern Tutchone Tribal Council comprises the Nacho Nyak Dun, Selkirk, and Little Salmon Carmacks First Nations. The Nacho Nyak Dun became self-governing in 1993, followed by Selkirk, and Little Salmon Carmacks First Nations in 1997. 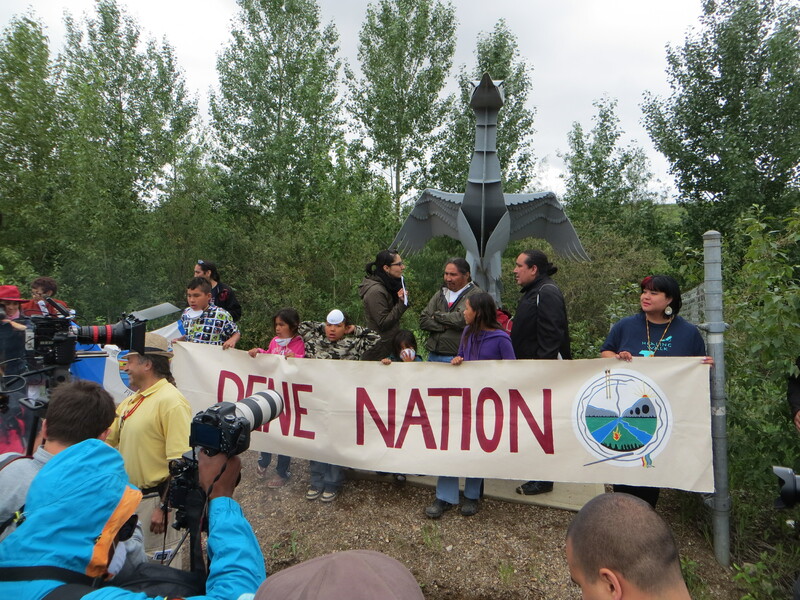 The Southern Tutchone comprise the Champagne and Aishihik First Nations (CAFN), Kluane, and the Ta'an Kwach'an First Nations. In 1993 the CAFN's and the federal government signed the First Nation's Final Agreement confirming the CAFN's rights to their traditional lands and resources. In 1998, Ta'an Kwach'an Council separated from the Whitehorse Indian Band and became an independent band, recognized by the Aboriginal Affairs and Northern Development. The Ta'an Kwach'an Council gained self-government and rights to the Ta'an Kwach'an lands and resources in 2002, and the Kluane First Nation signed their self-government agreement in 2003. Tutchone politician Judy Gingell was the first Aboriginal Commissioner of Yukon and served from 1995-2000. Julie Cruikshank, Life Lived Like A Story (1990) and Reading Voices (1991); Catharine McClellan et al, Part of the Land, Part of the Water (1987).